The third step in our REFUEL process, after seeking the refilling of the Spirit, and the restoring of Christ’s place on the stool of your heart, is to personally seek the power to grasp just how much God is crazy about us! His love is bigger than we can even imagine and we will be refueled as much as we take time to grasp His love for us and through us to others. Are you aware that your spiritual life is built upon a connection with the Trinity – Father, Son, and Holy Spirit? Have you felt those times when you are on the edge of “losing heart” or growing “weary” in working for Christ’s Kingdom? Maybe you have not recognized the signs of your spiritual tank running empty and needing to refuel. In this series, we will center our study around the amazing prayer of the Apostle Paul in Ephesians 3 where he prays for the church to be “filled to the fullness of God” as they face trials, tribulations, and temptations. Each week we will encounter this prayer and seek to participate in the call to REFUEL. 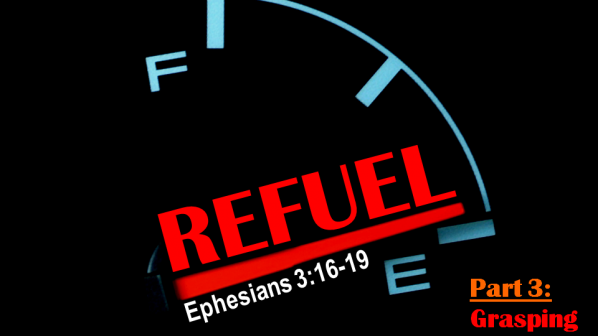 Refuel - Part 1 - Empty?